Aernout Mik (b. 1962, NL) questions political authorities and social imbalances in global society and uses these to develop video installations. Inspired by media images of the everyday, Mik creates multi-channel videos with actors, shown on large screens. 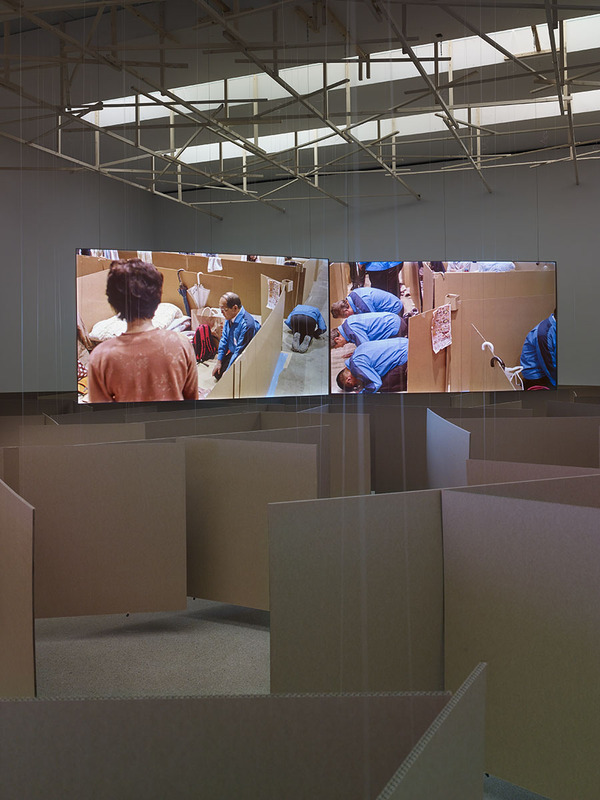 Although his videos are fictional, they give the impression of being documentary and thereby evoke a play of perception between reality and staging. The two video works that Aernout Mik is presenting at Kunsthaus CentrePasquArt are being shown in Switzerland for the first time. The exhibition reflects the fact that people have created systems such as the finance industry or certain technologies which are no longer under control and can therefore become an existential threat. 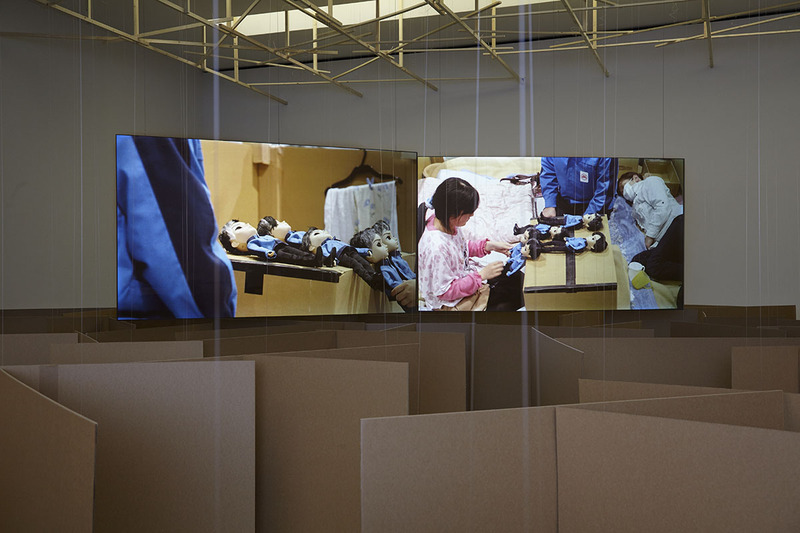 An example of this is the nuclear catastrophe in Fukushima, the starting point for the walk-in video installation, Cardboard Walls, 2013. 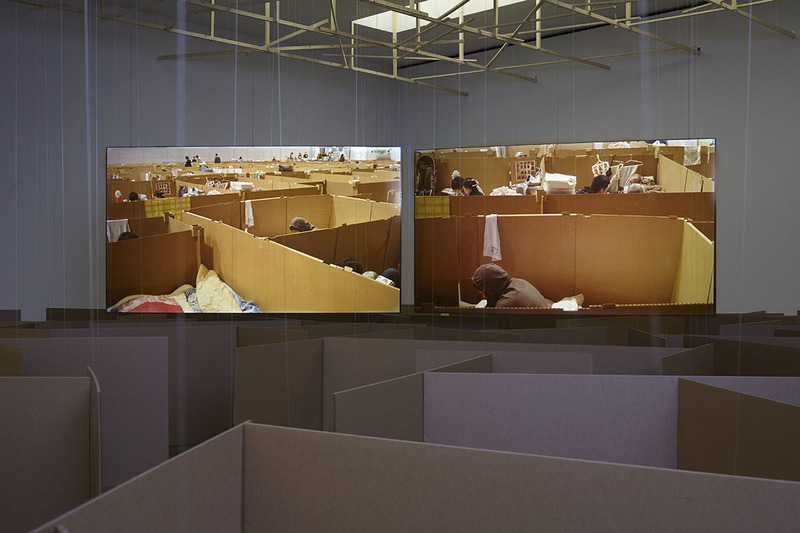 On two projections a migrant camp can be seen, in which those affected are accommodated in temporary cardboard booths. The situation intensifies when the board of directors of the company responsible for the accident makes a public apology and collective frustration, shock, solidarity and finally liberation ensue. 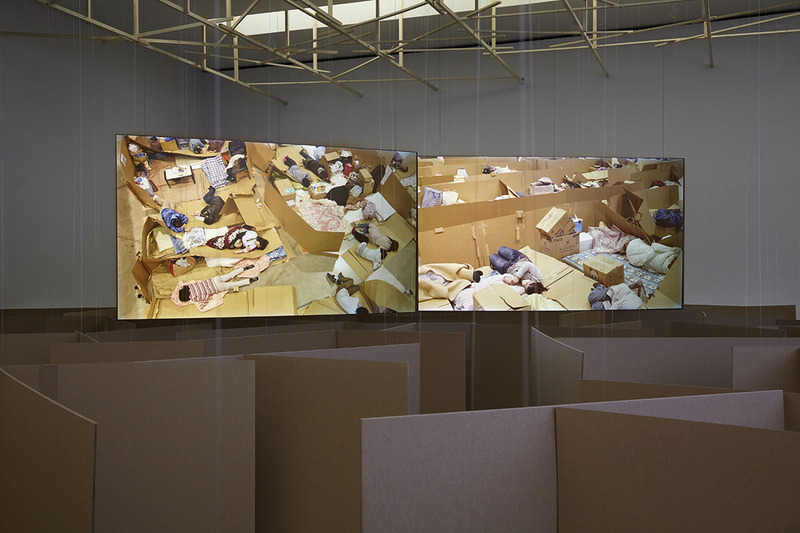 The spatial installation in the Salle Poma, a labyrinth similarly made of cardboard, allows observers to imagine themselves in the precarious situation. In this way it appeals to our recognition that the dangers of uncontrollable systems can in the end affect all of us. Aernout Mik’s work is based on his attentive and critical observation of a world subjected to on-going economic and political tensions. A world in which in western societies a basic degree of social and existential security is at the moment still guaranteed. The consequences of climate change or of neo-liberalism appear, however, to undermine these achievements of civilisation. Although the media report continually on these critical developments, many people are apparently immune to the implied warning signals. The impression given by this world is that as long as life in the comfort zone is not threatened, these problems remain merely disturbing background noises in everyday life. The explosions during the nuclear disasters at the atomic power station Fukushima Daiichi could be heard several kilometers away. On 11 March 2011, as a result of an earthquake, the electric power supply was cut, leading to an insufficient cooling of the reactor core and several core meltdowns. 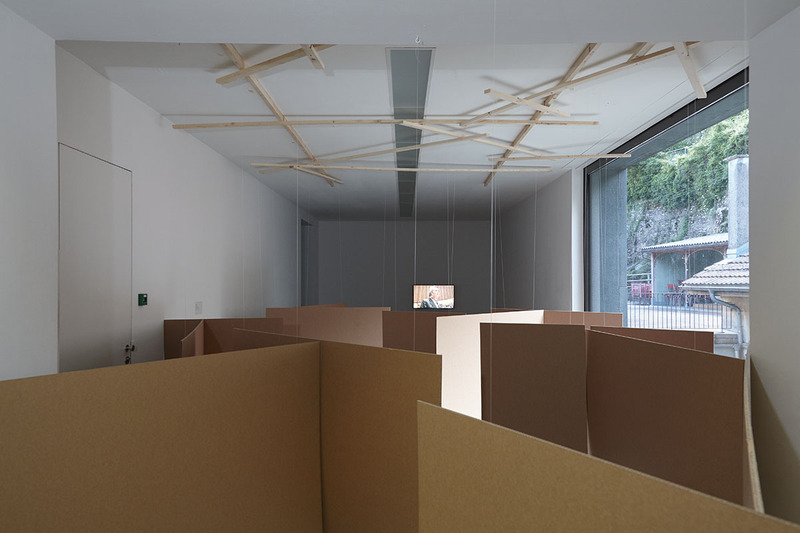 Through his video installation Cardboard Walls, Aernout Mik takes this occurrence as an opportunity to explore ecological and economic loss of control, the exploitation and contamination of the environment, shifts of power between institutions and individuals and finally nothing less than the continuing existance of humanity. 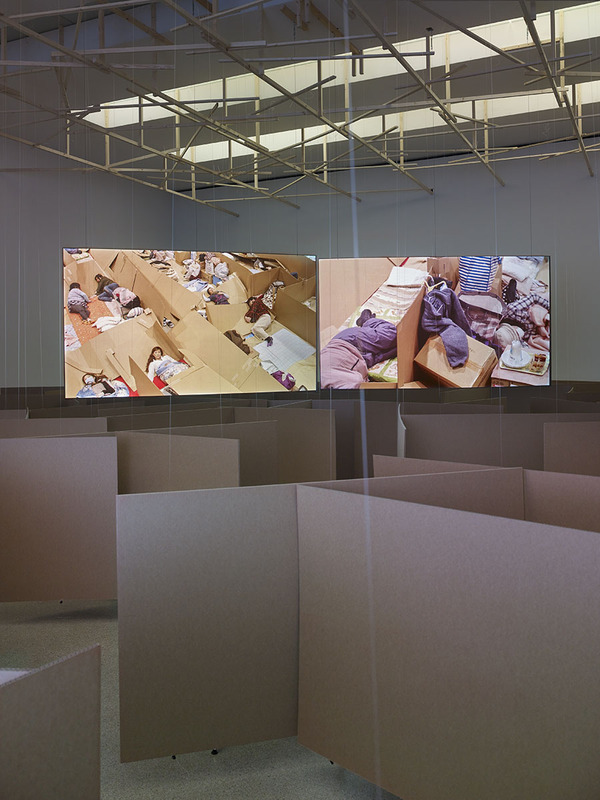 On two suspended screens in the middle of the exhibition space refugees are shown in a hall, in which, with their remaining belongings, they’re given shelter between unstable cardboard walls. They play cards, sleep or talk amongst themselves. Following the apology ritual of the directors of the company Tokyo Electric Power Company (Tepco), there ensue emotional outbursts, although emotion and incomprehension prevent an open escalation. The power relations shift irritatingly when the representatives of the company move among the refugees and lie down to sleep in the booths. In a flurry of collective emancipation the initial apathy completely collapses, with the people tearing down the cardboard walls and finally assembling them in a pile. The artist constructs a situation here which is not far removed from a possible reality, using the fact that stagings are nowadays understood unquestioningly as reality. The identification with the protagonists of the video is therefore also to be ascribed to the documentary aesthetic that allows the fictional scenario to appear to be real. The game with daily rituals and social forms of behaviour makes the scenes additionally familiar. This can release a self-examination in the minds of the observers and evoke questions concerning their influence on political and economic systems. Questions which were taken even further in the performance Untitled, 2013 in the context of the research congress FORMER WEST: Documents, Constellations, Prospects at the Haus der Kulturen der Welt Berlin. The performance, which as a video completes the exhibition, tests the boundaries of disobedience and noncompliance. For two days actors were present at the lectures. Immediately after the end of a well attended lecture in the auditorium they suddenly speak very loudly in tongues, disturbing the concentration of those present. Their bodies express protest, exude revolt and fall finally into a silent trance. Aernout Mik considers his walk-in video installations as stages of the present, on which he allows the actors in his videos as well as the viewers to perform. However, Cardboard Walls manages without verbose gestures or background noise. The soundless work is able to focus on the identification process between the viewers, who are equally a part of the work, and the protagonists and appears to make it possible to hear the sand in the hustle and bustle of the globalised world. Fotos / Photos: D. Müller.